A beautiful fall day in San Francisco means a beautiful summer day anywhere else. Fall is our summer and though we relish these fog free days and warm nights, there is always a hint of the latent chill in the air. For me, a warm day means one thing: the beach. I love the beach. It is and has always been a huge part of my life-it is absolute liberation. I run out at Ocean Beach regularly and derive much inspiration for my work from the random sightings and findings out there. What the waves carry in from all over the world and find its way into the sand--dissident objects pieced together-birds flocking, imprints left in the sand of footprints and others left behind, the wires that connect the rustic wood fence posts along the path, random pieces of hardware lying about. It all finds its way onto a plate design in some way. My new favorite obsession is a small strip of Judah out by 45th ave, blocks from the beach. Within this block and a half is one wonderful grocery store-- Other Avenue Foodstore, (http://www.otheravenuescoop.com/) an amazing raw food restaurant --Judalicious--that has the best hummous and purslane sandwiches EVER and then the new small jewel of a spot--Outerlands (http://www.outerlandssf.blogspot.com/). Named after what this part of the city used to be called, this sweet spot has a vibe all its own. From the Andy Goldsworthy inspired driftwood interior to the hearty fish stew and crusty loaves of bread baked in house, this is special. 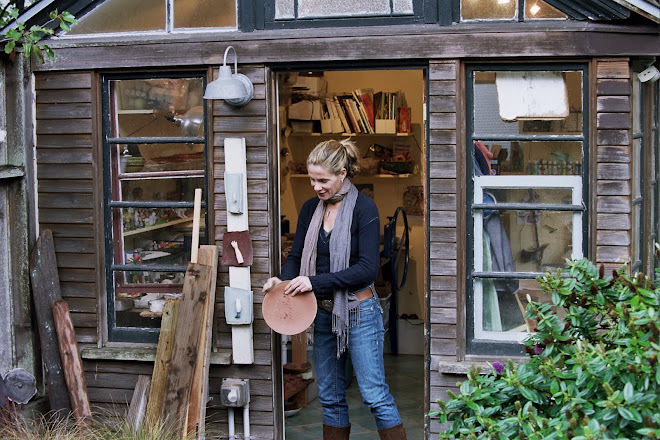 Yesterday, I drove myself out from my place in the Inner Sunset to meet two of my favorite gals--Margie and Dana-who themselves, create wonderment in the kitchen at Woodwards Garden (http://www.woodwardsgarden.com/). We sat ourselves down to a sweet meal of grilled gruyere,heirloom tomato and mushrooms, fresh greens and a feeling of contentment. The driftwood so inspires me--and also was screaming--"put a plate on the dark wood table and feel the aged turquoise combo!" 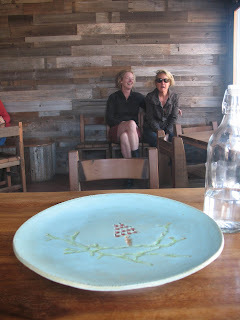 So here is my little lazy susan--smack dab in the middle of Outerlands, out by the beach.